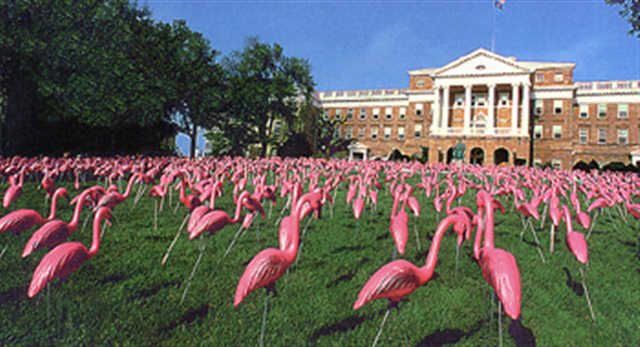 Pink flamingo from the flock that graced Bascom Hill on on the University of Wisconsin-Madison campus, 1979. As sleepy students made their way up Bascom Hill on the first day of classes in 1979, they were greeted by an unbelievable sight: 1,008 pink flamingos covered the hill in front of the dean's office. At 8am on September 4, 1979, members of the now legendary Pail & Shovel Party had begun planting the birds. By 2pm that afternoon, however, the ephemeral wonder had disappeared from the hill, the birds taken one-by-one by students who displayed them for years afterward in their dorm rooms, apartments, and elsewhere around campus. The Party's president, James J. Mallon, and vice-president, Leon D. Varjian, salvaged this flamingo and soon afterward donated it to the State Historical Society to preserve it for posterity. 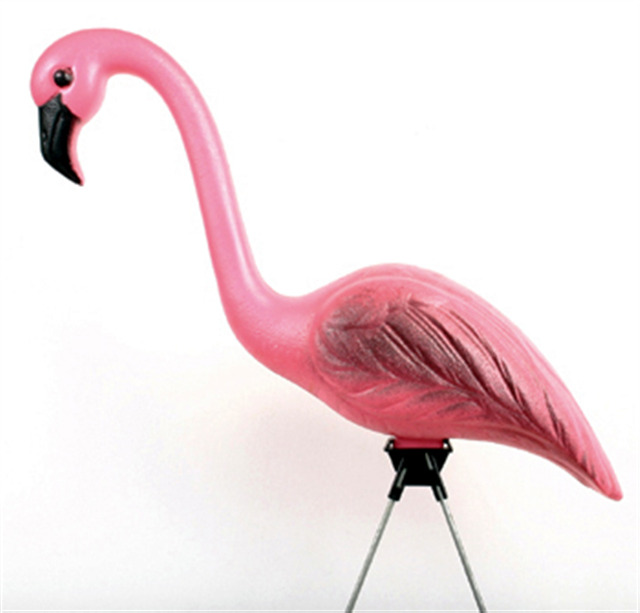 The pink flamingo flock represented a celebration of sorts for the Pail & Shovel Party which had won reelection to head the Wisconsin Student Association, the official student governing body. This admittedly absurdist party had formed primarily as a joke, campaigning in the spring 1978 student elections to convert the school budget into pennies to be dumped on the UW's Library Mall where students could use pails and shovels to take what they wished. The Party also promised to flood Camp Randall Stadium for mock naval battles, buy the Statue of Liberty and move it to Wisconsin, and change every student's name to Joe Smith, "so that professors in large lecture courses would know everyone by name." Contrary to even their own expectations, the Pail & Shovel Party garnered enough votes to win a plurality. After withstanding challenges to their victory by student leaders who took a more traditional approach to student government, the Pail & Shovel Party secured its power by winning 29 of 36 senate seats. 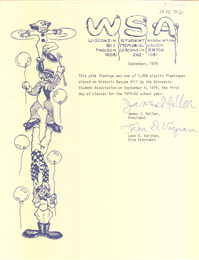 In their first year in office Mallon and Varjian wreaked havoc with the $80,000 budget allotted to student government (funded primarily through tuition fees of $2 per student), spending it on such events as a Little Feat concert, toys to occupy students during the boredom of class registration, a toga party for 10,000 people (blessed via telephone by Animal House star John Belushi himself), and a partial replica of the Statue of Liberty placed on the winter ice of Lake Mendota. Mallon later commented, "The student government at that time consisted of the self-appointed descendants of the superstar leftists of the sixties. ... It was very closed, very humorless and extraordinarily serious - about as dry and boring and distant from the mainstream students as it could have been." Mallon's assessment seemed to be correct, as UW students reelected the Pail & Shovel Party in the spring of 1979, fully aware of the antics they could expect. One campaign flyer for the Pail & Shovelers in the 1979 election read, "Are you nuts enough? A year ago you turned over the reins of student power to a couple of mindless clowns. Now we are asking you to go for it all. We are asking you to reelect Mallon and Varjian, who started it all, the two who made wackiness, nuttiness, irresponsibility, craziness and self-motivation household words. Are you nuts enough for that?" 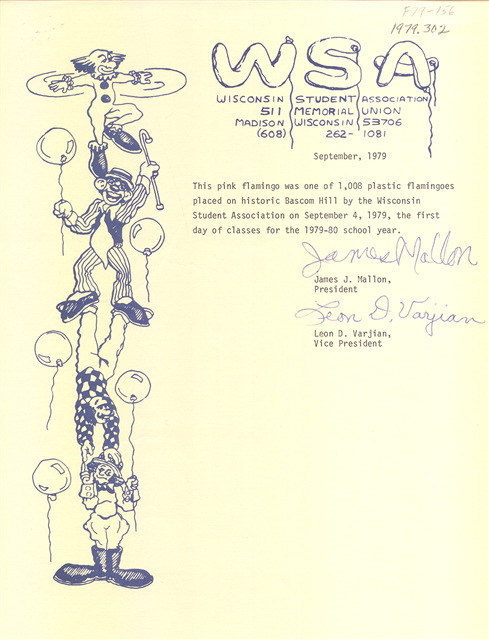 Students who voted for Mallon and Varjian were not disappointed as the flamingo flock greeted them on the first day of the fall semester, the image of which continues to sell postcards to this day. After the flamingo event, another year of "frivolous" stunts passed, with the Pail & Shovel party reprising some of the more successful events of the previous year as well as developing several new escapades. Perhaps realizing that the novelty of their party was wearing off, however, Mallon and Varjian decided not to seek reelection in 1980, and student government returned to a more traditional course.